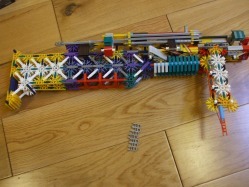 This is one of the most impressive knex guns I have ever seen as it can be loaded with over 15 bullets and can be fired rapidly with great accuracy and power. There is only one disadvantage in that you must tilt the gun ever so slightly to the left as the mechanism used which allows such great power allows bullets to sometimes fall out if tilted to the right hand side too much. Anyway enjoy building this knex model.